U.S. Secretary of State John Kerry speaks with Uzbekistan President Islam Karimov at the President’s Residential Compound in Samarkand, Uzbekistan, on November 1, 2015. The U.S. is mending fences in Kyrgyzstan and avoiding offenses in Uzbekistan. U.S. Secretary of State John Kerry is midway through what can best be described as a reassurance tour of Central Asia. Whether patching up relations in Kyrgyzstan or carefully selecting his words to avoid offense in Uzbekistan, Kerry is tiptoeing through a region often suspicious of U.S. motivations, but also desirous of U.S. backing and wondering what the U.S. has, or wants, to offer as the war in Afghanistan crawls its way to closure. The difference between language used in Kyrgyzstan, which completed widely-praised parliamentary elections in October, and Uzbekistan, one of the world’s most repressive states, is remarkable. Kerry’s first stop, in Bishkek, was aimed in part to help assuage some of the tension generated earlier this year when the U.S. State Department granted a “human rights defender” award to Azimjon Askarov. Askarov is currently serving a life sentence in Kyrgyzstan after being arrested and convicted in 2010 of inciting ethnic hatred during the post-revolution violence that erupted in the country’s south. A number of international human rights organizations say he was wrongly convicted. Bishkek reacted strongly to the award, scrapping a 1993 cooperation treaty and casting a cloud over the bilateral relationship. Dave Clark, of AFP, asked Kerry and the Kyrgyz foreign minister Erlan Abdyldaev about the award during a press conference. Kerry commented that the “award was given for a lifetime of work on human rights, not with respect to one event or something that may have transpired.” Both Kerry and Abdyldaev noted that the issue was discussed and expressed the desire to move on. 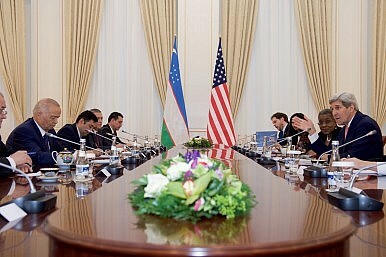 In Uzbekistan the next day, “human rights” was replaced by vague references to the “human dimension.” In remarks before his meeting with Uzbek President Islam Karimov, Kerry noted that there are four areas the two countries should focus on: economics and energy resources, environmental challenges, the “human dimension,” (“…the issues regarding individuals and their participation in society and in defining the future of the country, and their opportunities with respect to education and other issues”) and security. It was reported that behind closed doors Kerry brought up issues of human rights with Karimov, but there is little information on the substance of that conversation or evidence, yet, that it has yielded any positive impact. The Washington Post‘s diplomatic correspondent, Carol Morello, attempted to ask a question about human rights–calling out from the side of the room where Kerry and the U.S. delegation appeared to be concluding its meeting with the Uzbeks. She was quickly ushered from the room by an Uzbek official and a member of the U.S. diplomatic security. Washington’s relations with Tashkent have always been strained when it comes to human rights. In 2005, after the Andijan massacre in which Uzbek security forces opened fire on crowds of protesters, the United States and the EU levied sanctions on the country–particularly with regard to military assistance. The EU lifted its sanctions in 2009 and the United States relaxed theirs, in part due to the logistical needs of the war in Afghanistan. As Bruce Pannier commented recently, “gone are the days when the United States, of need, had to court Central Asia’s governments.” As the war in Afghanistan (ever more slowly) winds down, it’s becoming more unclear what the United States needs from Uzbekistan that necessitates sweeping the country’s human rights record under the rug.